Remember that little phone controlled BB-8 that everyone loved a while back? You can now get one for $30 for Cyber Monday which is stupid money considering it was $150 when it launched. Okay, so it is a refurbished one but at that price it's a steal. There are other cheap options at New Egg if you want, like $47 for a open box BB-8, or $57 for a new, untarnished, unopened BB-8. Whichever one you pick you'll get your own little remote controlled droid you can guide and play with via your phone. He also responds to your voice and records video and a load of other cool things. Get a Star Wars BB-8 remote control droid for $30! It's a refurbished one but compared to the $150 RRP are you going to complain? If you're more traditional when it comes to Star Wars then Amazon have an app controlled R2-D2 for $39.99, which is a 60% saving on the usual $99. 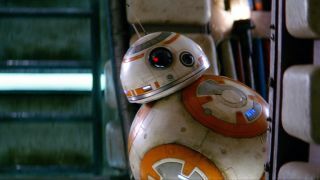 Again, like the BB-8 it can be remote controlled from you phone, it lights up, bleeps, can be programmed, and it'll watch the films with you, responding to key scenes. It means if you're a huge Star Wars fan you have a BB-8 and R2-D2 wheeling around your house for $70, which is still cheaper than the original launch price for either. Anyway, 'make it so, Harry', and all that. ome online stores give us a small cut if you buy something through one of our links. Read our affiliate policy for more info.